As Android L gets nearer and nearer Google has begun in earnest the process of updating its various core apps with the new Material Design aesthetic. The latest beneficiary of this refresh is the Google Play Store app, which has just been updated to version 5.0.31. The new Play Store app has the look, with a flatter yet bolder-colored aesthetic, and also comes with some UI changes. Overall it seems to be a positive change, though naturally your mileage may vary. 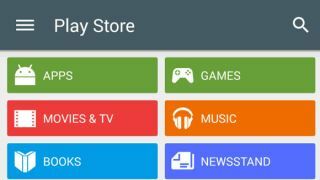 The new Google Play Store app, for example, places the "what's new" section of each app right at the top, so you no longer need to scroll down to see recent changes and updates. There are new icons as well, and a redesigned sidebar. The Google Play 5.0 update is rolling out to Android devices now, although if you don't want to wait you can head to Phandroid to download the APK and sideload it manually. Enjoy this test drive of Android L's design language before the newest Android update begins rolling out later this month.